Bridport, Dorset - Christmas Tree Festival, United Church. 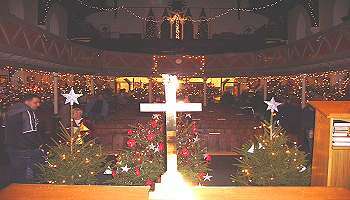 Over 60 decorated and illuminated Christmas trees in the United Church. Come and look at the trees and you will appreciate the hard work that has been done by the many community groups who have decorated the trees to make this festival possible. It is a sign of the very healthy community spirit that is found in Bridport and the surrounding area and of the wish of so many people to help others in good times and bad. All in aid of charities and other good causes. Copyright © 2007 - 2019 WestBay.co.uk. All rights reserved.